Francisco De Goya. Like any artist of his time, he made his money painting portraits. But if you look at what he chose to draw and paint on his own time, you'll see a different side; a darker side. Personally, I love his "Little Goblins"
I like how nonchalant these little goblins are. They seem so human. Goblins, like many fantasy creatures, have gone through countless iterations. We have seen everything from mischievous little tricksters to violent, cannibalistic cave-dwellers; and, more recently, the hive-minded, suicidal, warren-swarming beasties. Magic, too, has had many different takes on goblins. As early as Alpha, we have warring, pointy-toothed, green goblins. Pretty standard. 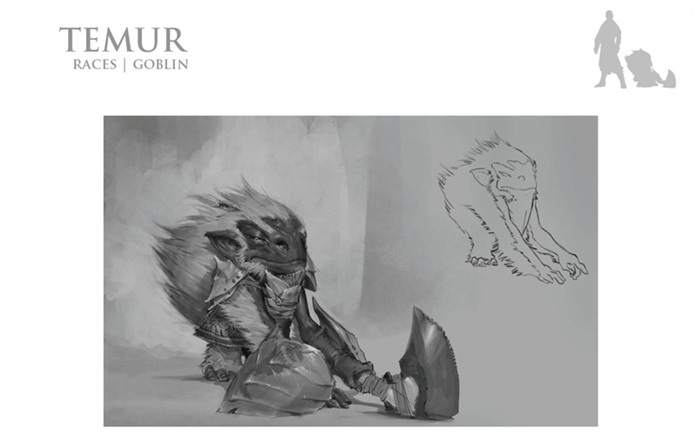 Lorwyn introduced a look into a detailed goblin society, showing a strong maternal current. Mirrodin's Goblins feel strongly like the Alpha originals, but we get to see their penchant for (overly complicated) machinery. Kamigawa's goblins, the Akki, have a different look to them, but they're still our lovable, chaos-causing rabble-rousers. I'd mention Theros, but it is one of the few planes that doesn't seem to have goblins! Poor them! 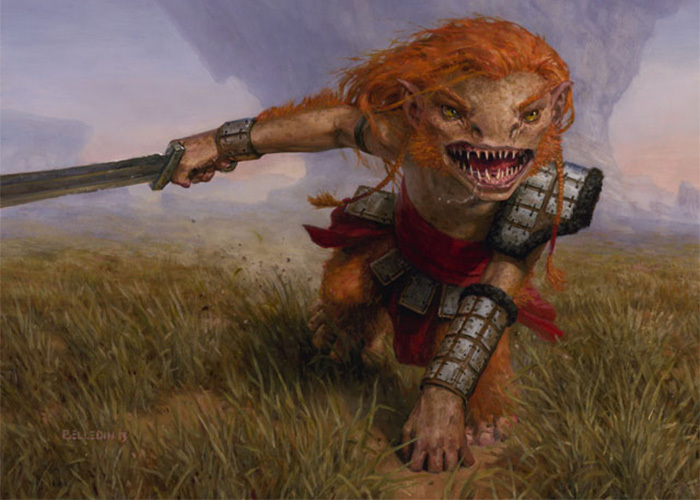 On Tarkir, there are two distinct types of goblins, Mardu and Temur. Let's take a look at the worldbuilding guide and see what they look like. 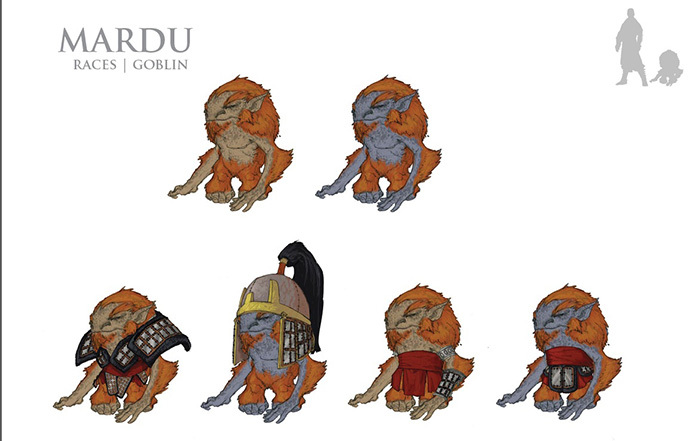 The Mardu goblins' fur colors and skin tones can vary. In the Mardu clan, they are a good representation of the speed that their warriors strive for. As Doug Beyer said in the Khans of Tarkir Worldbuilding Panel, "They attack first, ask questions never." Temur goblins are really furry. They have evolved to adapt to the cold and usually have white fur, although the skin tones can vary. My favorite Goblin in the set, that you might not have noticed, is the Intro Pack promo version of Ankle Shanker. What's great about this piece is how subtle the female features are. Did you catch that? This fierce Goblin Berserker is female! We've see female goblins in the past, but usually not in the capacity of warrior. There is no debating that you wouldn't want to get on the wrong side of this fierce little Mardu, though. She's even filed her teeth! Generally speaking, I really enjoy the new furrier Tarkir goblins. They even border on "cute," and you all know me by now, I simply can't resist the combination of deadly and cute.